The 41-year-old won a seat in parliament in June 2017 in what some commentators termed a “velvet revolution” led byPresident Emmanuel Macron, which saw grumpy voters turf out a whole generation of MPs from the country’s main political parties. The failure of Macron’s bid to restore faith in politicians in France could have repercussions in a country where anti-establishment far-right and leftist parties have never been so popular. Research published last week by the Cevipof political institute at Sciences Po university found more than two-thirds of the French people still had overwhelmingly negative views of politicians. Macron has interpreted the protests as a sign of impatience from an electorate desperate for change – for lower taxes on ordinary people, better public services, and democratic reforms. But analysts also see Macron’s perceived arrogance, top-down governing style, and tax policies favoring high earners as reasons behind the “yellow vest” revolt. Other research from Cevipof has shown that Macron’s MPs are mostly drawn from the middle or professional classes – with little experiences of the poverty and economic difficulties denounced by the “yellow vests”. “You can see in the ‘yellow vest’ movement the idea of what was called the ‘abolition of privileges’ during the Revolution,” he said, referring to the 1789 revolt that toppled the monarchy. “There is this revolutionary idea, that is recurrent and cyclical in French society, of wanting to take revenge on people that are seen as the privileged,” he said. 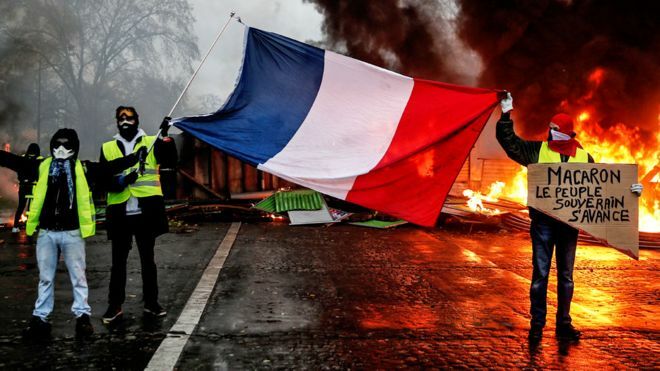 The gilets jaunes (yellow vest) movement started in mid-November and is a “recognizable” French socio-political phenomenon, using a classic French tactic: blocking roads so that the government will listen to their grievances, just like farmers, truckers, and others had before. A notable distinction this time was the movement’s ambition to block the transport system across the whole country.